i. The Left of the Labour Party, despite a few Zionists such as Jon Lansman and Rhea Wolfson (and the remaining members of the AWL), are pro-Palestinian. Not only have people not bought into the ‘anti-Semitism’ smears of but these allegations have had the effect that people have become educated as to the real nature of Zionism and the Israeli State's Apartheid policies. We have to transform support for the Palestinians into opposition to Zionism, the racist political ideology that has spawned Israeli Apartheid. What this means concretely is explaining that the 2 States Solution is a Zionist solution. The reason Labour Friends of Israel and the Jewish Labour Movement support it is because it will never happen. What it does is serve as a convenient smokescreen for the present, overtly Apartheid situation on the West Bank where there are 2 legal systems and segregation in every aspect of life between Jewish settlers and Palestinians. As long as the fig leaf of 2 States, which neither Likud nor the Zionist Union opposition supports, remains as a diplomatic pretence, then Israel has an excuse not to grant equal rights in the Occupied Territories. The call for recognition of a Palestinian state is even more absurd. Labour's leaders love it but how can you recognise a state that doesn't exist? ii. The tide has begun to change as a result of the alliance between the Zionists and the Labour Right. LFI MPs such as Chair Joan Ryan, Peter Kyle and John Woodcock were in the forefront of distancing themselves from Corbyn in the last election. Ryan went as far as to say she understood that her constituents liked May more than Corbyn! Labour candidate defending London seat admits people have more confidence in Theresa May than Jeremy Corbyn The Jewish Labour Movement, when Owen Smith challenged for the leadership, voted by 92%-4% for Owen Smith. People have also begun to see through the ritual accusations of 'anti-Semitism'. For example when I was first suspended in Brighton 18 months ago even some people in Momentum supported my suspension on the basis that there was no smoke without fire. Now it is clear to everyone that the accusations of anti-Semitism are weaponised and have no merit. iii. Jeremy Corbyn’s decision not to attend the Labour Friends of Israel fringe meeting at Conference went down well. It is less than two years ago that the Vice Chair of Labour Friends of Israel, Rebecca Simon was quoted in the Jewish Chronicle as saying of Corbyn ‘And he is rubbish — never mind about the Israel stuff, he is just not a credible opposition.” It was another supporter of LFI Michael Foster who went to court to stop Jeremy standing against Owen Smith. LFI is a front for the Israeli Embassy. It is Blairite through and through and is led by Joan Ryan MP, whose only achievement since being in Parliament is to claim record parliamentary expenses in 2006-7, having been the runner up the previous year. During the parliamentary expenses scandal she had to pay back over £5,000 having 'flipped' her main and second homes. 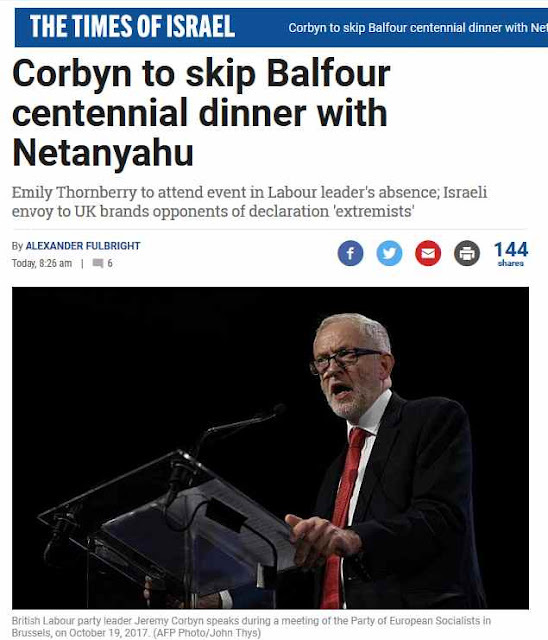 What is amazing is why Corbyn’s advisers ever thought that he would gain anything by appeasing Labour’s Apartheid lobby and attending Labour Friends of Israel’s events. iv. The attempts by the Jewish Labour Movement’s supporters on the National Policy Forum and this includes Emily Thornberry, to remove the Manifesto commitments to opposing Israel’s occupation, the settlements and the siege of Gaza, were reversed at Conference. iv. 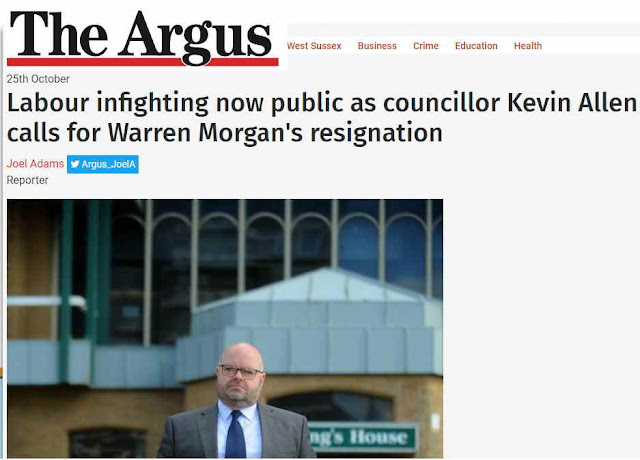 The attack by the Leader of Brighton and Hove Labour Group Warren Morgan on the Labour Party Conference as ‘anti-Semitic’ and his threat that Labour wouldn’t be welcome in Brighton has completely backfired with his only support coming from those well known anti-racist papers, The Sun and The Daily Mail.. At least 4 Brighton and Hove branches (including Preston Park, East Brighton, Queens Park, Brunswick & Adelaide) have called for his resignation or an apology. Veteran Labour Councillor Kevin Allen has broken ranks and called for Morgan to go. 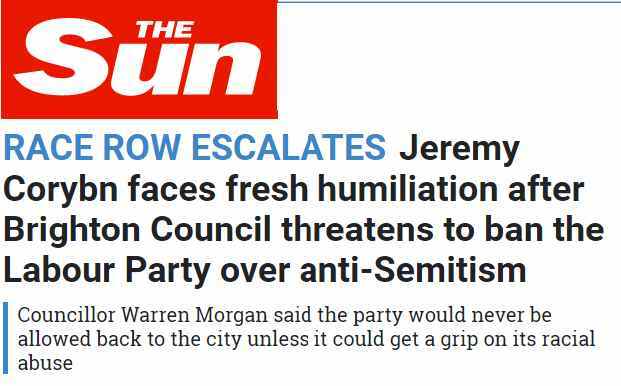 Morgan has taken to turning up uninvited to Ward meetings to try and persuade them that he should not be censored. v. Free Speech on Israel and the newly established Jewish Voices for Labour held large meetings at Conference and the JVL meeting was attended by union leaders, Len McLuskey of Unite and Tosh MacDonald of ASLEF, who promised support to an alternative to the racist Jewish Labour Movement. vi. 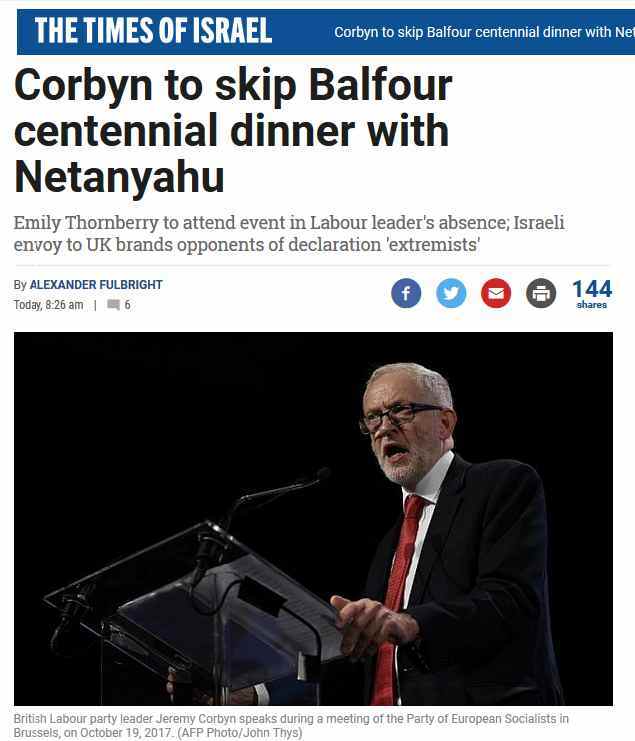 Corbyn has turned down an invitation to a Balfour Declaration cententary dinner provoking apoplexy amongst the Zionists. It's not 'antisemitic' for Jeremy Corbyn not to celebrate the centenary of the Balfour Declaration – it's sensible. Indeed throughout Britain the Zionist celebrations of the Declaration have fallen flat. The Zionists had hoped to make propaganda out Britain’s agreement to steal the land of the Palestinians and hand it to the Zionists 100 years ago but most people have been unmoved. Indeed a poll commissioned by the Israeli propaganda group BICOM found that the number of people supporting the Declaration had dropped from 43% in the past year. 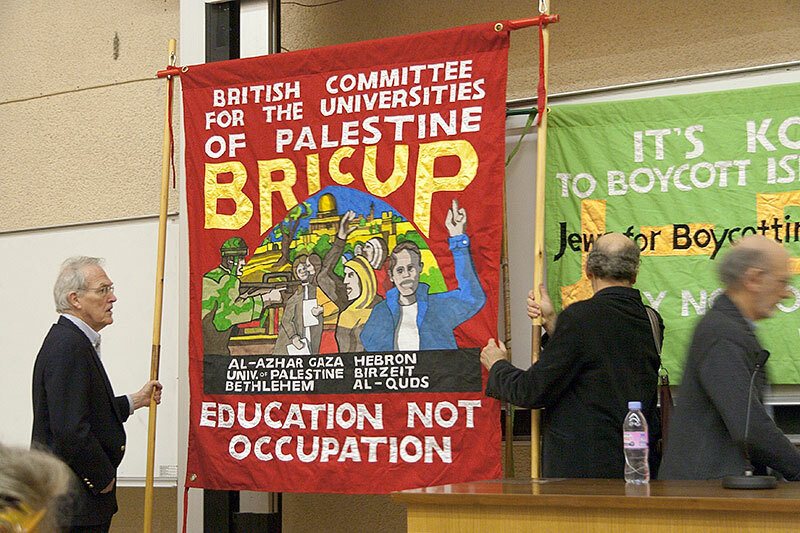 News has just come in that the Balfour celebration event at the University of Manchester, which has recently come under heavy attack has now been moved elsewhere. Officially the sponsors decided to move the event but it is clear that they were made to feel unwelcome. vii. The Zionists were particularly outraged at the Labour Party Marxists newsletter at Labour’s conference entitled ‘anti-Semitism is not anti-Zionism’ and an article by Moshe Machover describing the support that the Nazis gave to the Zionists even whilst most Jews were trying to overthrow the regime. This provoked the Right into ‘auto excluding’ i.e. expelling without a hearing Moshe Machover, the veteran Israeli anti-Zionist and founder of Matzpen. This in turn has provoked a furious backlash by Labour Party members resulting in dozens of party units sending in motions condemning this outrageous breach of Labour Party democracy. All the indications are that the witch hunters, led by Sam Matthews of the Disputes Committee are looking for a way to backtrack. Expelling Jews and Israelis for ‘anti-Semitism’ may be the Zionist way of tackling ‘anti-Semitism’ but it is not how most people see it! People are increasingly seeing through the ‘anti-Semitism’ smears and realise that the reason for the Right’s fondness for the International Holocaust Remembrance Alliance definition of anti-Semitism has less to do with hatred of Jews and more to do with their inability to defend Israel. Everyone knows that anti-Semitism is negligible in the Labour Party. That is why the behaviour of Jon Lansman in supporting the idea that anti-Semitism in the Labour Party is a problem is disgraceful and only gives comfort to Corbyn's enemies who aren’t in the least concerned about racism. The fact remains that the Zionists are still strong and entrenched in the structures of the Labour Party. The JLM is an affiliated socialist society with the power to move resolutions at Labour Party conference and have delegates to the CLPs. 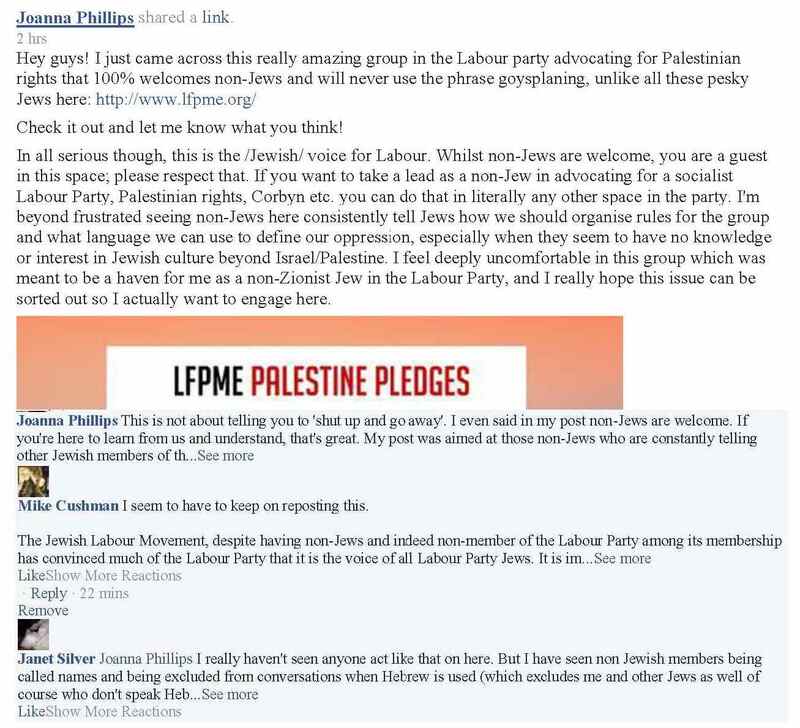 The fact that the ‘sister party’ as it calls itself (in fact the British wing of the Israeli Labour Party) is represented inside the Labour Party at all and is taken to be the Jewish wing of Labour is an outrage. It is the living proof that racism and the legacy of the British Empire have not been eradicated inside Labour. The affiliation of what was Poale Zion was a direct consequence of the British Empire’s alliance with the Zionist movement. Balfour, known as ‘bloody Balfour’ in Ireland was the foremost representative of the Empire. The traditional pro-Palestinian group, Labour Friends of Palestine is worse than useless. 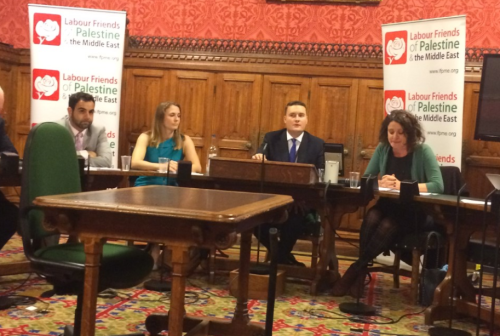 Its latest escapade was to hold a meeting at the House of Commons with one of the authors of the false anti-Semitism campaign, Progress MP Wes Streeting. It has kept quiet during the past two years of the false anti-Semitism campaign. It was blindingly obvious to most people that allegations of ‘anti-Semitism were weaponised against supporters of the Palestinians yet LFP said nothing saw nothing and heard nothing. Indeed many of their supporters were up to their ears in this campaign because most of their parliamentary supporters were anti-Corbyn. LFP have 133 MP supporters whereas LFI have just 76 MP. Yet this is deceptive. Not only has the LFP site not been updated for a long time, the late Gerald Kaufmann is still listed, as is Simon Danzuk but another curious factor stares out. 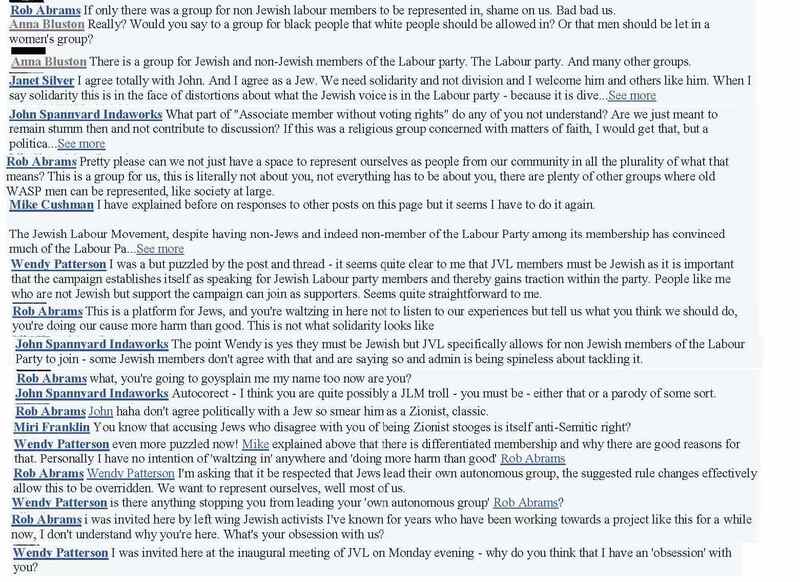 Nearly half the Labour Friends of Israel supporters, 36 in total are also supporters of the LFP. In other words half the LFP’s supporters are on both sides of the conflict between the oppressor and oppressed. In practice most of these people are died-in-the wool Zionists like Streeting, Ian Lucas and Stephen Twigg. The full role call of the opportunists is below but what this shows is that there is a need within the Labour Party for a new, pro-Palestinian organisation. A campaigning group which is anti-Zionist and which calls for a democratic, secular not a Jewish state. We can leave that to the LFI. 35 years ago, in the wake of the 1982 Lebanon invasion the Labour Committee on Palestine, later the Labour Movement Campaign on Palestine was formed. At the 1982 Labour Party conference it was able to able to get a motion supporting a democratic, secular state on Palestine passed. Any campaign on Palestine must tackle the racist and apartheid nature of the Israeli state. Two states plays into the hands of the Zionists which is why LFI and JLM support it. The call for 2 states, apart from being impossible to achieve, which is why the Zionist organisations support it, is wrong in principle. It accepts the partition of Palestine. It accepts that an apartheid Jewish state will continue. But worst of all, as long as there are illusions in such a state then Israel has a pretext not to grant the Palestinians of the West Bank full equality or indeed any democratic or civil rights. One of the key demands must be for Labour to break with Zionism and that means the JLM must be disaffiliated. We don’t call for them to be expelled as individuals although most of them would leave. The idea that a supporter of Israeli Apartheid, affiliated to the World Zionist Organisation which funds the settlements in the West Bank, should be an affiliate should be a matter of shame. In 1984 Jeremy Corbyn sponsored and chaired an LMCP Conference which specifically called for the breaking of links with Poale Zion. Corbyn may now prefer not to remember his previous role but it is our job to remind him. The Israeli state should not have a presence within a socialist party. What then of Free Speech on Israel and the new Jewish Voice for Labour? All the indications are that with the formation of JVL, FSI has been cut adrift. When Tom Watson attacked FSOI over the remarks that Miko Peled made when he said that everything should be discussed including the Holocaust, this was distorted as meaning he wanted a debate on whether the Holocaust occurred or not. 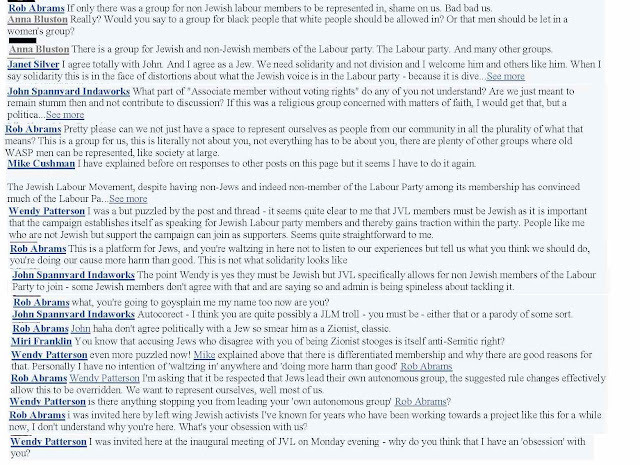 Elements in JVL, in particular David Rosenberg of the Jewish Socialists Group, refused to defend Peled or FSOI. That leaves the newly formed Jewish Voice for Labour. Its meeting at conference, over 300 people attended to listen to Avi Shlaim and Sir Stephen Sedley. The meeting was a great success and it made a great impact. But one meeting does not an organisation make. The question is what it does with that impact. As I’ve already said, JVL faces a choice – Jewish anti-Zionism or Jewish Identity Politics. JVL can become an organisation that actively campaigns against Labour Zionism in the Labour Party or it can engage in Jewish identity politics. What it can’t do is fudge the issue. When I was first approached to sign their founding statement I said that their formation as a Jewish only group was a mistake. Their role is a political not an ethnic one. There is a role for Jewish only groups in e.g. BDS, but in the Labour Party there is no point. Apart from anything else it restricts your membership. There was the absurd position whereby the JVL was criticising the JLM for having non-Jewish members. JVL is in the worst possible world of having non-Jews as associate members and Jewish members as full members with voting rights. An apartheid model of organisation is not a healthy one. 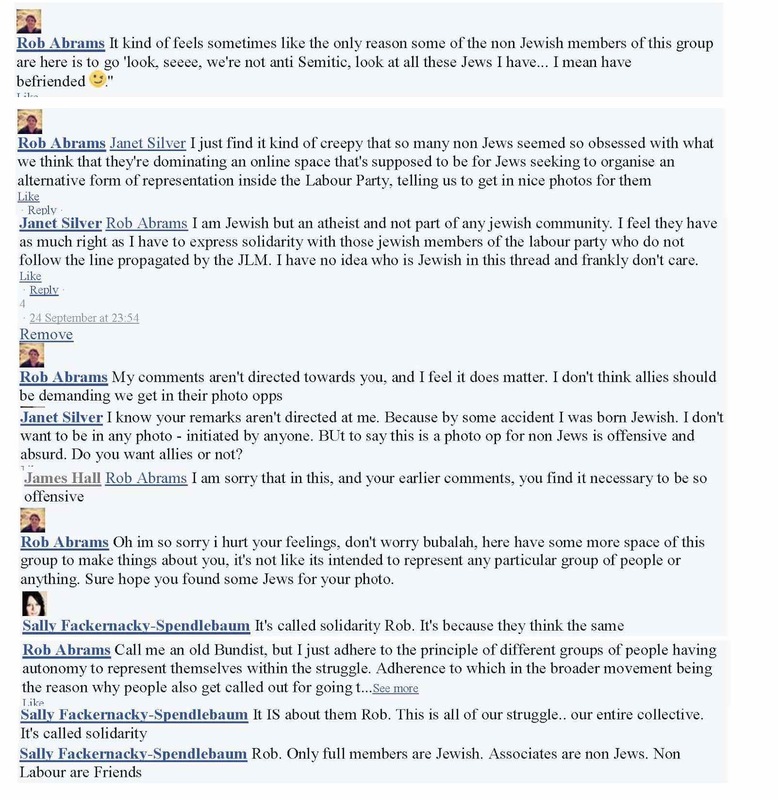 Rather than face my criticism openly and honestly, the moderators of the Facebook group, led by the Jewish Socialist Group’s Ian Saville and Julia Bard chose to exclude me from the group. The result was predictable. A few weeks ago their Facebook group exploded. What had once had over 200 members was purged. People were forced to reapply with the result that current membership is around half the original number. Because of their paranoia and despite me arguing to the contrary, they turned the FB group from a closed group into a secret group, meaning no one can find them anymore! Hardly the way to build a mass organisation. 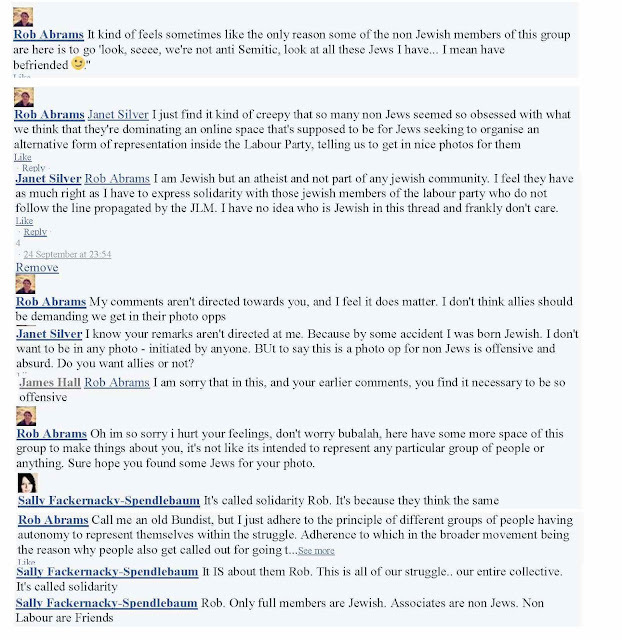 Below I have included some screenshots of the ‘debate’ that occurred between Jewish chauvinists, mainly soft Zionists like Rob Abrams, Miri Franklin, Joseph Finlay and others and non-Jewish members which led to the exit of most non-Jews and a few Jewish members too. Some of the comments border on racism. At one point some of the Zionist members decided to speak in Hebrew in order that non-Jews couldn't understand them. 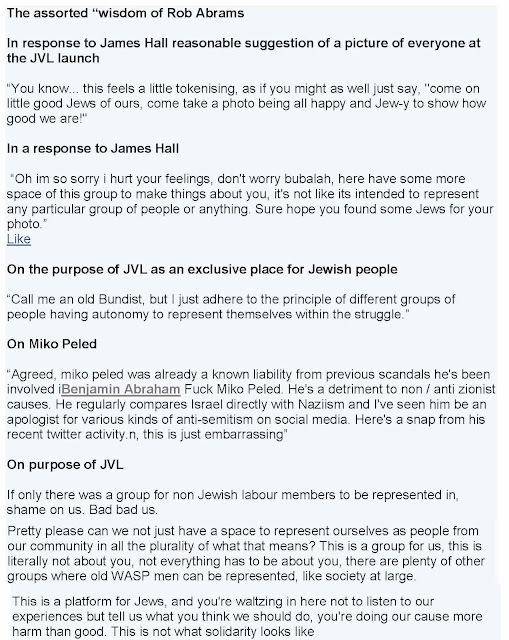 The founders of the JVL excluded both the International Anti-Zionist Network and myself from their founding meeting because of these disagreements. What they have to do if they want to retain democratic credibility is hold an open conference where these things can be discussed. It is right that it shouldn’t be a hardline anti-Zionist group, however it is wrong that it should say absolutely nothing about for example the Palestinian Right of Return or the Apartheid nature of the Israeli state. Given that Israel is a Jewish state, it is incumbent upon Jews to take a clear stance on Israel and Zionism. I suspect that the Jewish Labour Movement could also sign up to this statement. It is meaningless. Is it opposed to segregation in Israel? Does it support the Jewish nature of the Israeli state, that is Jewish supremacy? Does it support the Right of 'Return' of Jews? Nothing is to be gained by appeasing its soft Zionist fringe. If it is seriously trying to supplant the JLM then it should be honest and open and say that it stands for their disaffiliation because the latter group represents only Zionist Jews (& their non-Jewish supporters). The JVL has to decide what its role is. 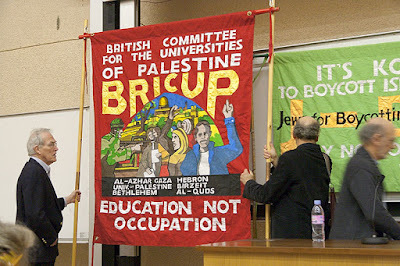 Is it there to confront the Zionist presence in the Labour Party, which is involves opposition to the alliance with the United States or is it simply a place where liberal leftish Jews can get together to exchange their experiences in some kind of consciousness raising group, in the mistaken belief that Jews in Britain are oppressed as Jews? I have had my differences with Norman Finkelstein who, despite his pedigree as an ex-Maoist, is really an old time John Stuart Mill radical, over such things as BDS but no one can doubt that Norman is a powerful and brave intellect. It is therefore with some shock that I read that he was brutally arrested in the middle of the night by New York Police, because of criticism he has made of 2 corrupt lawyers and a corrupt judicial system. Norman is 64 years old. He was, in his own words, treated like a ‘sack of potatoes’, handcuffed, thrown to the ground and his head banged against the wall by these police thugs. This is no doubt normal in the Trump State of America. It is a lesson that even leftist intellectuals are not immune to the attentions of the State if they step of line. It would appear that Norman did exactly that. I’ve taken this article from Norman’s site. It appeared in something called the New Nationalist. As I’m not a nationalist I’ve edited certain phrases that could be considered anti-Semitic however the substance of what the article says should be widely disseminated. For his troubles, Finkelstein was ultimately removed from his professorship. He’s a prime example of what happens to Jews who are opposed to Zionism. 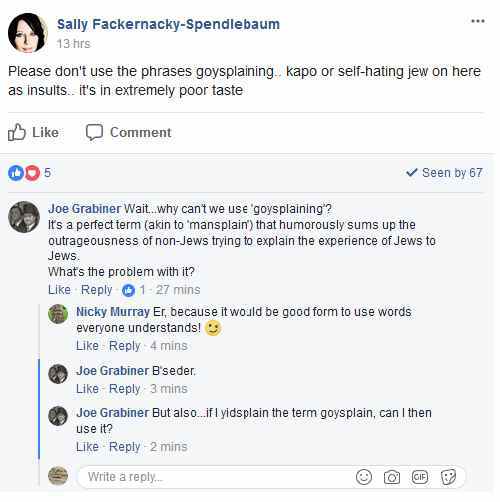 He has also dwelled on the politics of the holocaust and wrote the books “The Holocaust Industry: Reflections on the Exploitation of Jewish Suffering” and “Beyond Chutzpah: On the Misuse of Anti-Semitism and the Abuse of History.” He has an acerbic tongue and tells it like it is, as demonstrated below. He is not afraid to go head to head with police state Zionists like Alan Dershowitz and Bernard Levy. See the next video in which he effectively called them overrated mouthpieces. In an NPR interview head to head with Dershowitz, he called the latter a plagiarist. Finkelstein was able to show rather convincingly some highlighted sections of Dershowitz’s book that were lifted directly from previous works without citations, including the same ellipses and spelling errors. 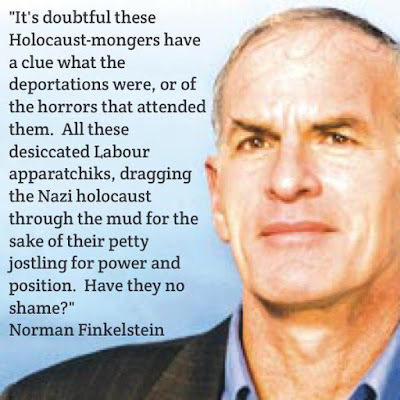 Dr. Finkelstein has a natural tendency to go to bat for those who are suffering from true (versus faux) injustices. In observing Finkelstein over the years, he sometimes wears his emotions on his sleeve. He also does not suffer fools lightly and can be combative. Recently he was involved in defending a Guyanese medical doctor who was once one of his students. According to Finkelstein, Dr. Rudolph Baldeo had fallen prey in a divorce case to a couple of Long Island matrimonial lawyers named Michael Chetkof and Allyson Burger. The case and the affronts are discussed on Finkelstein’s blog. Finkelstein also gives the background at a site where he is organizing a petition to disbar these attorneys. For those who dislike injustice, you know what to do. 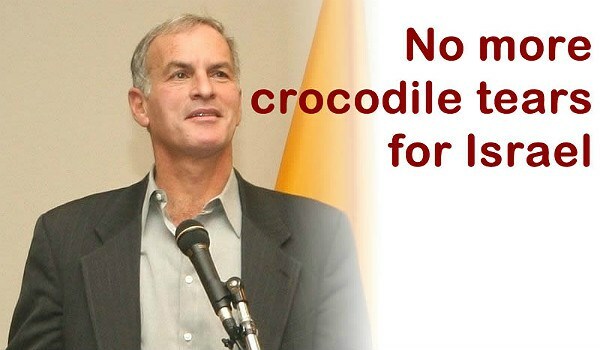 Finkelstein states. When I told these vulture-lawyers that I was writing an article to expose the shakedown, they threatened to “open Pandora’s Box” and destroy Dr Baldeo “Personally and Professionally.” Michael Chetkof and Allyson Burger are blackmailing Dr. Baldeo to silence me. On Oct. 9, the situation took a turn for the worst in what can only be described as star chamber justice. Star chamber justice is a topic we have written about before. Not surprisingly what is being put forth here is NOT being covered in any major media. That night Norman received “the knock at the door” in the middle of the night. He was arrested by two Nassau County detectives who jailed him. Curiously, he was due to appear in court the next day at his friend’s case. TNN can find no charges or due process for justifying this type of arrest. Finkelstein called the lawyers involved “mafiosi,” serial liars and the female half, Burger, “a normally loquacious yenta wannabe.” But libel cases are civil and don’t involve middle-of-the-night arrests. Nor do failures to answer a non-felony summon. 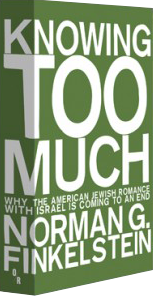 Norman is now accusing his enemies of being behind these strong-arm star-chamber tactics. He recounts the incident in his blog and in this video clip. Norman is 64 years old. Two Nassau County (Long Island) detectives barged into my apartment in the dead of night without a search warrant. I was only wearing my boxer drawers. I refused to put on clothes. They pinned me up against the wall and handcuffed me. For the next 18 hours, I was relentlessly brutalized by these thugs. The next day at 2:30 p.m. I came before Hon. Judge William Hohauser. He was shocked! He was appalled! How could I be wearing my boxer drawers in court?! The judge demanded $7,500 bail and ordered that I get a full psychiatric evaluation. When Tom Watson, Luke Akehurst, Warren Morgan or any other creature of Labour’s Right talks about ‘anti-Semitism’ you can be sure that they aren’t talking about anti-Jewish racism but defending Israel’s colonial racism by making counter accusations of racism as a means of throwing sand in peoples’ eyes. Palestinian Bedouin children playing at the Tyre School, Khan al-Ahmar, the only robust structure in the village (it is made of rubber tyres).The school has 170 students, of which 85 are girls, and is run by 15 teachers. The students come from five different Bedouin communities in the surrounding area. It is partially funded by EU governments. 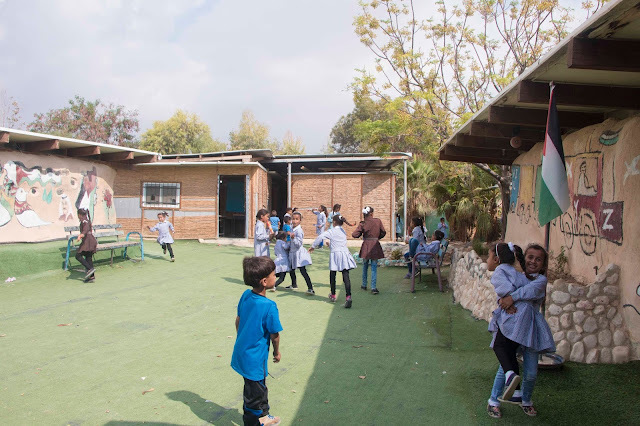 It has many classrooms, a small football field made with turf, and a playground. Photo uncredited. Israel’s racism, in Judaifying an area, is no different to the Nazis 'deJewifying' areas of Jews. It is indefensible politically or morally. The only response is to ratchet up the Boycott Divestment and Sanctions campaign. We know that this is the weapon that the Israeli state most hates because they have set up a $50m+ dirty tricks fund under the Minister of Public Security, Gilad Erdan. Everywhere BDS is under attack because it is held to be ‘anti-Semitic’. In America states such as Kansas are demanding of those who do business with the state that they declare they have nothing to do with BDS. In Texas people are being refused aid as a result of the recent hurricane unless they agree to sign a piece of paper saying they oppose the Boycott of Israel. Apart from this being an outrageous infringement on the right to free speech under the First Amendment this shows the lengths that Israel's Apartheid Lobby will go to force people to support their state. It is therefore good to see the American Civil Liberties Union taking legal action against the State of Kansas in order to stop it penalising people who exercise their right to engage in BDS actions. In this country we see those apostles of anti-racism – the Daily Mail/Express/Telegraph et al in the forefront of labelling solidarity with the Palestinians as ‘anti-Semitic’. Their hypocrisy is belied by their own racist record when it comes to discrimination against every other group bar Zionists. This would be the first time an entire Palestinian community has been demolished since 1967. Khan al-Ahmar, home to 173 people, is located in Area C – the 60 percent of the West Bank under full Israeli control. 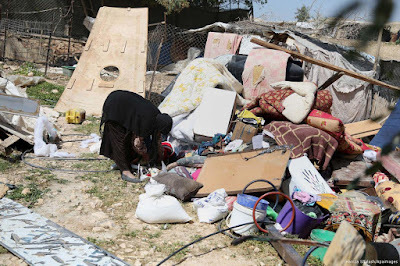 The Israeli government considers the community’s presence there illegal, and has issued demolition orders for all of its structures earlier this year. The village is home to one of 20 Jahalin Bedouin communities at risk of expulsion due to Israeli settlement expansion in this area, strategically located between East Jerusalem and Ma’aleh Adumim, the West Bank’s largest settlement. Known as E1, an Israeli construction plan for this area has been frozen since 2009, following international outrage. The communities are made up of 2,300 Palestine refugees who were originally displaced by Israel in the 1950s. Plans for this area, critics have argued, are aimed at linking Ma’ale Adumim to Jerusalem, therefore breaking the territorial contiguity of a prospective Palestinian state – and jeopardising the feasibility of a two-state solution. “There’s proof this community has been here since 1967. We are only the first piece of the puzzle in the bigger picture,” Abu Khamis told Palestine Monitor. “If they relocate this community, they will relocate all other communities in the area,” he said, adding that he believes international pressure can help postpone the transfer – a strategy that has worked over the years, while leaving the community in a constant state of insecurity. Residents of the nearby settlement of Kfar Adumim, together with the pro-settler organisation Regavim, have been filing petitions to evict the residents of Khan al-Ahmar and demolish its primary school – which serves 174 pupils from the village and five neighbouring communities – since 2009. Regavim, which is involved in other high-profile demolition cases in the West Bank, such as the village of Susyia in the South Hebron Hills, declares its mission to be “ensur[ing] responsible, legal, accountable & environmentally friendly use of Israel’s national lands and the return of the rule of law to all areas”, as stated on its website. The fourth and last petition was filed in 2016. Unlike on previous occasions, the community’s lawyer, Shlomo Lecker, is concerned that this time the court will accept the State’s answer when asked to provide an alternative for residents. Israel plans to relocate them to lands near the Palestinian town of Abu Dis, in an area known as Jabal West. “It’s a symbolic act to please the right-wing,” Lecker said, speaking at a meeting with representatives of NGOs and diplomatic missions last week. The appearance of Bedouin villages, now often built from scrap materials, is, like Khan al-Ahmar L, often of a makeshift and ramshackle camp. 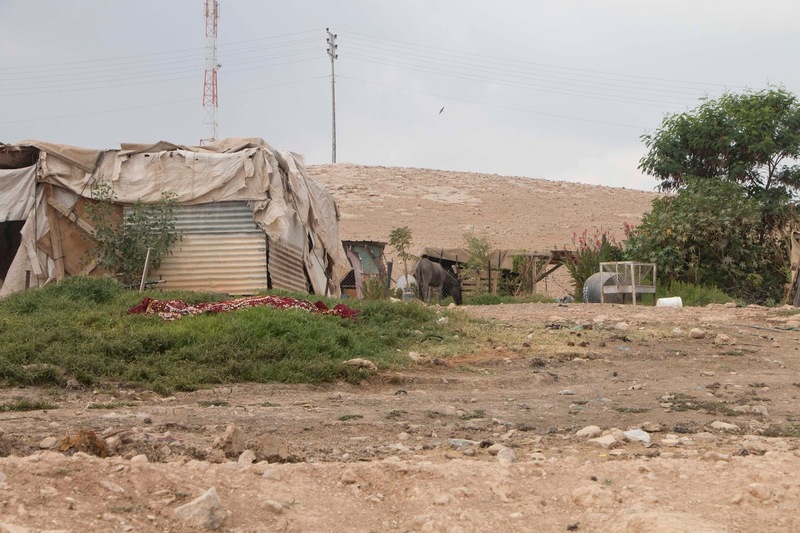 Like other Palestinians, Bedouin cannot get permits to build more substantial homes. Rights groups have opposed these plans. “It appears that the forceful displacement of the residents of Khan al-Ahmar is a form of “compensation” for his right wing supporters for the upcoming evacuation of the Illegal outpost of Derech Ha’Avot, following a High Court ruling,” the statement added. 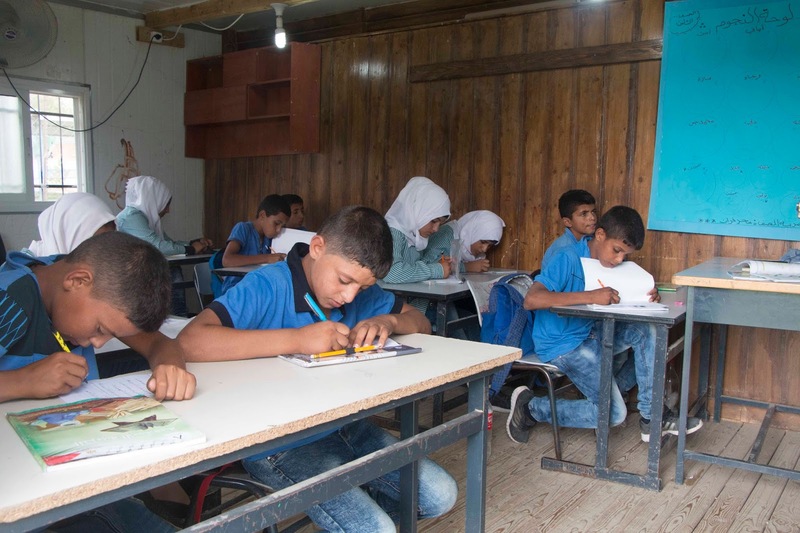 Learning to read and write, to paint and to play: what will happen to these children’s education if yet another Bedouin village is demolished? Meanwhile, children at the “tyre school” nearby are taking a break and playing outside the class-rooms. The school, which stands out as the only real building in the village with its painted mud walls – the rest are makeshift structures made of wood and corrugated iron – provides a safe space for children to play as well as study in this isolated desert community. Despite its location just off a highway a few kilometres from Jerusalem, the only road that leads to the village is an unpaved, winding track. Britain First’s Leaders Paul Golding and Jayda Fransen 'On the Run' - Tales of a Fascist Duo! Dig Deep for Fascist Scum! For some reason Britain First keeps emailing me the latest escapades of their leaders, Paul Golding and Jayda Fransen. For some reason they think I am a supporter! It’s only exceptionally that I put up a fundraising appeal on this blog. It has to be an especially deserving cause. 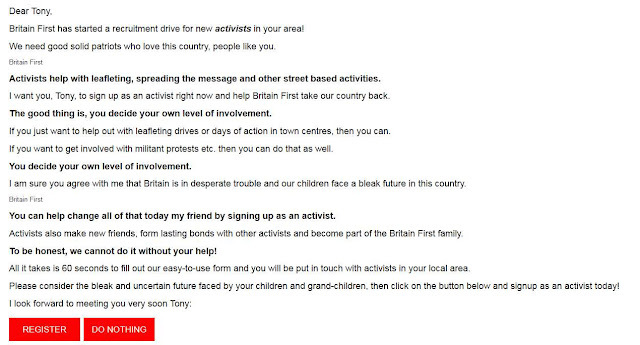 When the desperate plea from Golding and Fransen arrived in my Inbox I was particularly moved. Both of these individuals are, it would appear, on the run from the British Police after having absconded rather than stick to bail conditions that prevent them from harassing people. For some reason they keep writing to me. I did unsubscribe a few months ago but they keep writing to me to ask for more cash which is why I am turning to you dear reader. Why have I been resubscribed? I suspect it is dirty tricks from one Jonathan Hoffman whose best friend is Britain First’s ‘Intelligence’ Chief Paul Besser. Both like to picket Palestinian and other meetings on the grounds of ‘anti-Semitism’. I must admit, Britain First is in deep trouble. For four weeks, Deputy Leader Jayda Fransen and I were literally “on the run” across Europe, unable to return to the UK because we would have been arrested at British border control and sent to prison. After managing (against the odds and in disguise) to get back into the UK via a route with no passport control, we were picked up at a Scottish port and driven down to England where we "laid low" for 24 hours. Deputy Leader Jayda Fransen was a guest speaker at the “Justice for Chelsey” protest in Sunderland the following day. With a team of security officers surrounding her, Jayda managed to smuggle herself into the crowd who marched her to a rally point and handed her a microphone so that she could speak about the injustice Chelsey Wright has suffered. Over a hundred police officers rushed and surrounded the protesters, who linked arms to stop the police getting to Jayda! But the bully boy coppers stormed the crowd of men, women and children, determined to apprehend Jayda. After seeing the police knocking over old ladies and manhandling fully grown men, and after they threatened to use CS gas on the crowd, Jayda decided to give herself up to avoid anyone getting hurt! It was a disgraceful sight, watching an army of police bullies literally attacking a crowd of peaceful protesters! The police thugs even choked a dog that Jayda had been pictured with during the protest. Jayda was led off and locked up for two nights in a stinking, rotten police cell, with nothing but four walls to keep her company! Whilst Jayda was in custody, Sunderland police station received numerous calls from Kent Police demanding that Jayda be transported down to Kent where she would have to spend 100 days in prison on remand waiting for her trial! But Northumbrian police ignored their demands and refused to transport Jayda to any court outside of their jurisdiction. Come Monday morning, Jayda found herself cuffed in the back of a meatwagon and led into the dock at South Tyneside Magistrates court, with Kent Police still pressuring the court to remand her in prison. By a stroke of divine luck, the Magistrates told Kent Police to take a running jump and they released Jayda from custody! Jayda then received a hero’s welcome in Sunderland and Kent Police skulked off to lick their wounds. The following day, both Jayda and I were in the dock again, this time accused of “harassing” a gang of convicted migrant child rapists in Kent. Kent Police, now angry that their plan to lock up Jayda had failed, tried to throw both of us in prison on remand, but to his credit the judge told them to sod off! The judge fixed a date for our three-day trial and released us from custody to meet the national press who were waiting outside. Make no mistake: The establishment and their police stormtroopers are determined to destroy our movement! Only your support can scupper their evil plans and stop Jayda and I going to prison after our trial for “harassing Muslim gang rapists”. Britain First is being financially drained by the constant and relentless court, solicitor and legal costs incurred throughout this incessant harassment! This is part of their plan: Lock us up and drain all of our resources so that the Britain First movement ceases to exist! But, they underestimate our British bulldog spirit and unwillingness to buckle in the face of their diabolical schemes. We are British Lions, and we will not surrender or cave in, ever! Can Jayda and I depend on your unwavering support as we battle the forces of evil that are destroying our nation? Will you give us your most unshakeable backing during this dark and troublesome period? We depend on you Tony, there is no one else we can turn to!